Randall Wallace and Chris Parker, Heaven is for Real. Directed by Randall Wallace (Culver City, CA: Sony Pictures, 2014). 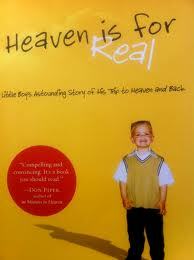 Todd Burpo and Lynn Vincent, Heaven is for Real: A Little Boy’s Astounding Journey of His Trip to Heaven and Back (Nashville, TN: Thomas Nelson, 2010). I don’t usually go to the cinema looking for spiritual edification. But there was really nothing else on last weekend, my wife wanted to see it, and I am a well-behaved husband. 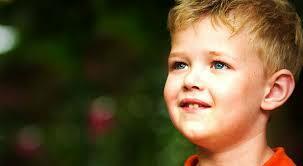 According to the trailer, Heaven is for Real (2014) is the true story of a four year old boy, Colton Burpo, who almost died during an emergency appendectomy. After the operation Colton told his parents graphic details about his trip to heaven, including having met his sister who had died in a miscarriage before he was born (he had never heard of her before). The movie is cynically marketed at an evangelical audience desperate to see its worldview sympathetically shown on the big screen. Based on the New York Times best-selling book, this small-budget film grossed over $75 million in its first month. 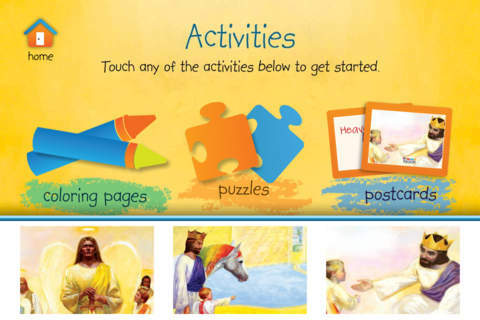 You can now buy versions of the book for children and toddlers, as well as downloading apps for your iPhone complete with colouring pages and Jesus’ rainbow horse. Heaven is for Real has received some deservedly scathing reviews from Christians sickened by its sloppy theology, poor acting and childish script. But despite all these problems, I found myself deeply moved. I was so moved, in fact, that I immediately went out and read the book. 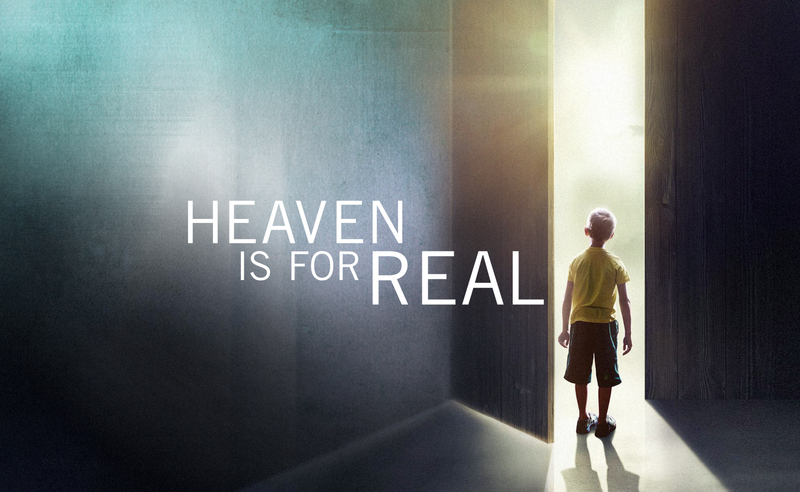 Heaven is for Real was written by Colton’s father, a Wesleyan pastor from a small town in Nebraska, and Lynn Vincent, a freelance writer with a number of bestsellers under her belt who caters to conservative American audiences. Unexpectedly, the book was nowhere near as good as the movie. Although the book is told from the father’s perspective, it is essentially a summary of Colton’s descriptions of heaven. After each revelation the narrator, Todd Burpo, reminds the reader that the Bible gives the same information about heaven. Colton could not have known what the Bible says, of course, because at four years of age no-one had told him that Jesus sits at the right hand of God or that he has wounds on his hands and feet. For the skeptics, in addition to meeting the unborn sister he had never heard of, Colton also meets his great-grandfather and later recognizes him in a photograph that he had never seen before. All of this is easy to dismiss as hallucinations and wishful thinking, of course, and I am not particularly impressed by other people’s visions or religious experiences. What I did get out of the book was a renewed appreciation for Christian child-rearing. The parents read Bible stories with their kids each night, pray with them, and take them on pastoral visits to hospitals. But more than this, they treat their children as spiritual seekers in their own right. They acknowledge that children are the experts on their own experiences of God and they enjoy listening to what their kids have to tell them. The movie has a lot more to it. The first thing that struck me as the plot unfolded was how idyllic life in small-town Nebraska is. Todd Burpo is the perfect father, a renowned preacher whose sermons never go for more than thirty seconds, a volunteer firefighter, and a tradesman who works for free when his clients cannot pay. He coaches high school wrestling and plays on the community softball team. He is also clean cut, white, middle class, and the epitome of the ideal American male. Unlike in the book, where she comes across as Todd’s intellectual and spiritual equal, in the movie his wife is a pretty face whose job is to be pampered by her husband while looking on helplessly as works through his own spiritual struggles. Although she works in real life, in the film Todd Burpo is willing to make any sacrifices to prevent his wife having to get … (gasp!) a job. Their church is filled with loving people, including token African American and Hispanic families, and the only less-than-edifying character in the whole movie is a university professor who doesn’t believe in the authenticity of Colton’s vision. The sun apparently always shines in Nebraska, illuminating the ripe wheat fields and bountiful farms which fill in the pauses between scenes. The film’s shameless refusal to portray America as a sociologist sees it, with its inequalities, real economic hardships, broken medical system and deep-seated corruption, made me wonder why it is so important for American Christians that their religion be presented together with a fake version of reality. I had two thoughts: First, this is reality for many people. Small, inward-looking communities that are ethnically and religiously homogeneous do exist in America, and the fact that they are usually located side-by-side with less prosperous neighbourhoods doesn’t mean that the inhabitants allow themselves to see their neighbours. And within those communities are genuinely good people. This is something that is difficult for someone who had never been part of a faith community to fully understand, but churches really are good places full of good people. They are also full of broken people, but this doesn’t mean that church members don’t pray for one another, work on each other’s houses’ for free, and share one another’s joys and hardships as if they were their own. My second thought is that Christianity is portrayed like this because what we are selling is a cultural product and a way of life. The unspoken assumption is that if you become a Christian you will also get all of the material and social benefits that come with being a white, middle-class citizen of a prosperous country. The politics are thinly veiled. We admire Sonja Burpo’s decision to give a cherished baby dress to a Hispanic couple because that is what white people should do for the less fortunate. And we respect that couple when they buy Todd dinner, because this is a fitting response to white people’s charity. We mourn with the mother whose son, a marine, died a war hero in Iraq and we are sure that he has gone to heaven. We rejoice with the Burpos when they discover that Sonja is pregnant with their fourth child, because fetuses are people too. There is no separation of Christ and culture here. For the film’s producers, culture, politics, and religion form a seamless whole, and you cannot have one without the other. And yet, despite these all of these problems, I was moved and edified by Heaven is for Real. Jesus did not come for the clever, the educated, and the politically correct. He speaks through children. Whereas in the book Todd Burpo just enjoys and endorses his son’s visions, in the film they disturb him profoundly. Does he really believe in heaven, or is it just a story you tell children? Is it okay to preach that people are going to heaven (and hell)? How would it change our everyday lives if we knew that heaven or hell awaited us? These are serious questions that we, I, need to wrestle with. 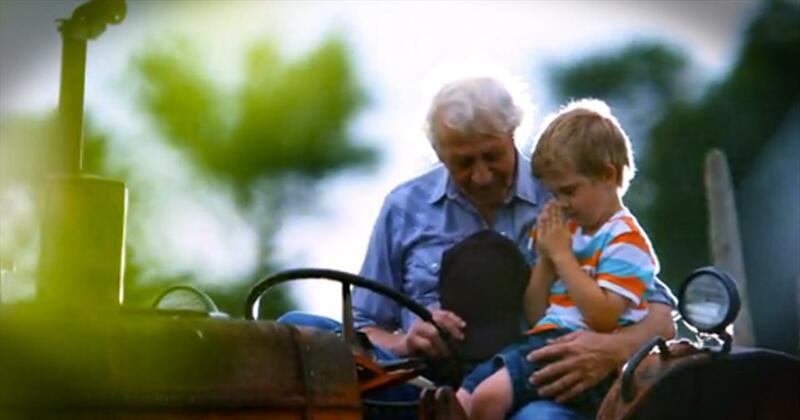 There is something beautiful about watching a small child pray with his grandfather, and Colton’s description of Jesus as “really nice” needs to come back into our vocabulary. Even though we refuse to make an idol out of white middle-class America we can still acknowledge that there are good people, and loving churches in this world, and we can strive to become like them as we too become more like Jesus.